Ubuntu One is the new trending app which caters 5 GB (free) online storage space to the users, popularly known as “Ubuntu Personal Cloud”. This App is very similar to the existing Apps like iCloud, Google Music, Skydrive, Live Mesh etc. For your information, the codes at the client side of the application is written in the language called ‘Python’ and this Apps works on operating systems like Ubuntu, Windows, iOS and Android. See the comparison between Ubuntu Cloud and Apple iCloud. Just one apps for all devices. 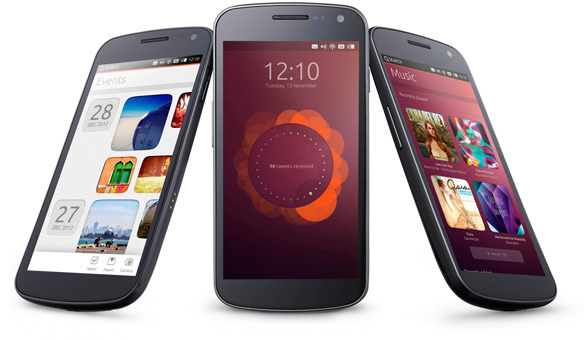 Ubuntu one is very instant and has better features than other contending Apps. You can expect your data to be accessed from any of your systems at any point of time, provided you have an Ubuntu one account and have shared the data in your Ubuntu Personal Cloud. è Sync your data from a device and instantly find it available on rest of your devices. è Make a collection of your favorite songs and just play them on the fly on any of your devices using the Ubuntu One account. è Click a photo from your cell and magically see it on your other devices in no time. Imagine yourself clicking random pics in a jungle and your mates watching those sitting far away on your laptop. Exciting! Ain’t it? è One can even send links of the files to his friends and family, for them to download. Links from other photo apps can also be sent or shared on social media sites like FB, Twitter etc. è Can also be used as a file transfer utility App amongst all your devices. How to get underway way with Ubuntu One App? Step 2: Follow the instructions and fill up your details. per the OS installed on it. Note: Don’t forget to install the Ubuntu App on all your devices you want to use in order to avail the storage space ie, Ubuntu Personal Cloud. The wait for Ubuntu 12.04 (Precise Pangolin) has come to an end. 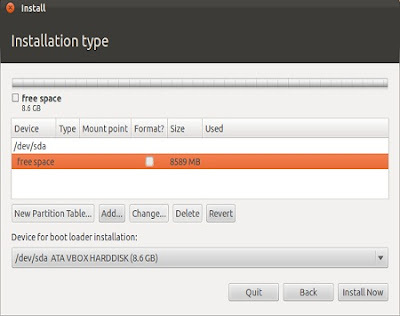 If you want to experience the Ubuntu 12.04 environment, you can download its iso file from here and install it comfortably by following a few steps. Installing Ubuntu 12.04 is all the same as installing any of the other versions of Ubuntu with just a touch changed GUI. 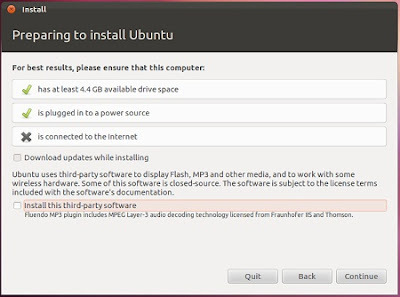 To install Ubuntu 12.04 you must have at least 10GB of free space as a pre-requisite .The steps given here can also be used to dual boot Ubuntu 12.04 and Windows 7.To dual boot Ubuntu 12.04 and Windows OS, first you got to empty any one of your drives having at least 10GB of total capacity. Then format it to make it free (shown as green is Disk Management in Windows). Ubuntu 12.04 can be dual booted with Window 7, XP or Vista. Given here are the step-by-step instructions to install Ubuntu 12.04 along with relevant screenshots. 1) Boot from a boot-able Ubuntu USB or CD(DVD is recommended). 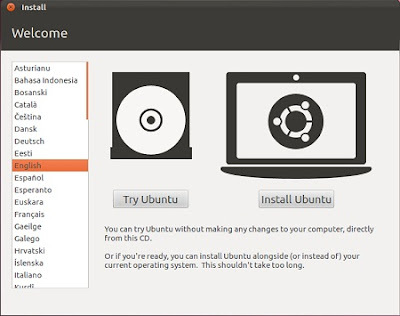 2) The following Ubuntu screen will appear. Ubuntu 12.04 installation step 2. 3) The following window will appear. 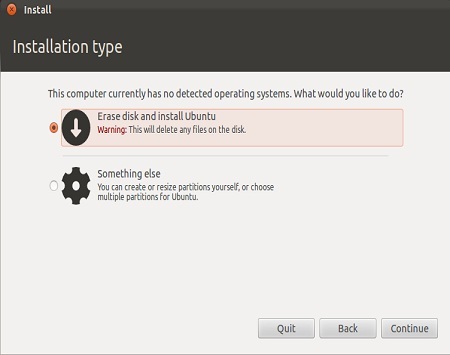 If you select the option “Erase disk and install Ubuntu”, the already installed OS gets deleted/erased and Ubuntu’s installation gets underway. In case you want to dual boot Ubuntu 12.04 select the option “Something else”. Step 3 of Ubuntu 12.04 installation. 4) Then the following window appears. In this window select the disk drive in which you intend to install the Ubuntu 12.04.In this window, a drive is shown as free space. Select the drive and click on change option. In the options, “Device for boot loader Installation” select the master hard-drive of your system(usually it does not require any change). 5) After clicking on change option, the following window will appear. Step 5: Set the drive size here. Define the size of the partition (8GB is recommended). In the “Use as” option select “Ext4 journaling file system”, the latest file system in Linux and then select mount point as “/“. Press OK.
6) The next window which you will see, appears the same as the window in step 4. The only addition here the sticking up of the Ext4 and “/” at their respective positions ie, in the Type and Mount point columns ( corresponding to the drive you have selected) . Make sure you have these options next to your selected drive else you got to check your taken steps again. Once sure, click on “Install Now”. Note: The method shown above is a simple guide. You can also create additional partitions if you want, namely, /boot, /home, etc. In that case, you will have to divide your available free space accordingly. Normally, “/” should be given around 8GB space as all the installed packages go into it and remaining space can be given to other partitions. 8) Now, you will be asked to select the time zone and keyboard layout of your system. 9) In the last window, give the name and password of your system(you need to give an alphanumeric password and obviously remember it for future use) and after this click “Next”. 10) With this your Ubuntu installation is done!!. Reboot and you shall see the Grub menu at the start, allowing you to choose the OS from which you want to boot up. Note: About the Swap partition, now a days laptops and desktop come with a large RAM, it is not advisable to use swap partition. Just try to keep things simple, swap partition can be created later on. See here how to create Swap partition. If you find yourself stuck at any of the steps mentioned above, do post your queries as comments here.